This CD starts out with what sounds like a drunk girl singing “Silver Cloud” into an answering machine. Then when the actual “Silver Cloud” hits you, it really hits you. This is Carlile’s first full-length release. Her site describes the music as “agro punky pop rock” which I guess I can agree with (even though I’m not sure what the “agro” part means). Some songs have a bit of a hard edge to them as well. Brandi’s voice is a powerhouse. I know she reminds me of someone but I can’t place it. Dare I say a tad of Avril Lavigne? Yep, that’s it, but more mature. I don’t think that’s a bad thing. There’s room for everyone…but definitely room for Carlile. “Glory” has radio-hit written all over it. “Tired” has a cool melody and here her voice is at its Avril-est. I’ve never been a big fan of the screaming that sounds like it hurts…ala Janis Joplin so “Somewhere Along the Way” is slightly bothersome to me. It honestly sounds like she’s wrecking her voice. I know some people enjoy that, it just sounds too painful to me. I want to give her a lozenge. She also has this thing where she pronounces “s” like “sh”, that tends to be distracting to me as well. Though some might find it endearing. I will say that she does the pretty ballad very well. Her voice is really very good. On her slower, softer songs such as “Until l I Die” (which is my favorite here) “Wasted” and “Caroline” this really stands out. Her lyrics are smart and emotional…very well thought out and well written. I can see her becoming very popular as long as she gains the exposure she should. Comment: This CD is simply amazing as well as all of her others. i fell inlove with her the first song i heard. 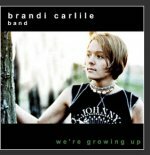 Comment: I heard Brandi Carlile perform a few songs live and I fell in love with her music, but I haven’t been able to find her CD “We’re Grwoing Up” anywhere. Any suggestions on where I might be able to get this cd? Personally I love this CD as well as her two previous ones. I have been of fan of Brandi’s for years and will continue to be. I can listen to her sing forever and listen to her albums non-stop. I reccomend you see her in a samll, intimate, setting like she plays now before you have to pay a bunch to see play bigger venues. Brandi sounds sooo much better than avril. Brandi definitely will surpass any artist in talent. She is just amazing and her voice is beautiful. She is a ticking timebomb waiting to explode into the mainstream. Avril? give me a break. I can’t listen to Avril’s CD non-stop like I do with Brandi’s. There’s something much more to Brandi than any of the pop tarts her age. Hey, Just wanted to check in with the individual who left the message about being in touch with Brandi’s people to purcahse the CD “We’re Growing Up”. Any news yet? Thanks for checking. I’m also looking for albums “Room For Me” And “Open Doors”. If anyone has any info that would be great. Wow, I just did a search, and turns out, I could make a house payment if I sold mine. Amy, Let me know if you’re ready to make that house payment. I would be willing to help out.